"D.J. Wilson" redirects here. For the New Zealand architect, see Derek Wilson. For the American musician, see Scary Kids Scaring Kids. At Capital Christian School in Sacramento, Wilson endured a fifth lumbar vertebra stress fracture, which sidelined him during the summer of 2012 and part of his junior season, which caused him to lose the attention of some recruiters. He spent three months in a back brace from his hips to his chest. By the middle of his junior season, he completed a 1-year 5-inch growth spurt that took him to a height of 6 feet 8 inches (2.03 m). By June 2013, he had recovered enough to tally 22 points and 8 rebounds against Ivan Rabb at a California Golden Bears camp event at Haas Pavilion. Soon thereafter, Michigan and other schools began recruiting him. The defending 2013 national runner-up Wolverines hosted him (and Devin Booker) during the first weekend of October 2013 and he accepted Michigan over offers from USC, Gonzaga, Northwestern, and Harvard. Wilson signed his National Letter of Intent with Michigan on November 13, 2013, with the expectation that Jordan Morgan would graduate from the 2013–14 Wolverines team and both Glenn Robinson III and Mitch McGary would enter the 2014 NBA draft. At the time of his signing, he was believed to be the first Sacramento area player to ever sign with a Big Ten Conference school. Wilson posted 29 points for Capital Christian School against Rabb and Bishop O'Dowd High School in the Northern California Open Division championship loss on March 22, 2014. After having committed to Michigan as the 135th ranked prospect of the national class of 2014 in October 2013, Wilson's ranking rose to 86th by April 2014 according to Rivals. "Michigan 2014 Basketball Commitments". Rivals.com. Retrieved 2017-04-05. "2014 Michigan Basketball Commits". Scout.com. Retrieved 2017-04-05. "Scout.com Team Recruiting Rankings". Scout.com. Retrieved 2017-04-05. "2014 Team Ranking". Rivals.com. Retrieved 2017-04-05. Prior to the 2014–15 season, Wilson had surgery on his little finger, and he was sidelined during some of the offseason and the August 15 — 24 four-game exhibition tour of Italy. Upon his arrival, he was diagnosed with valgus deformity ("knock-kneed"), and his neuromuscular therapy would eventually increase his vertical jump by 8 inches (20 cm) during his college career. During the fifth game of the season for the 2014–15 team against Villanova in the 2014 Legends Classic, Wilson was injured when he was blocked and knocked down on a slam dunk attempt against Dylan Ennis. He was sidelined due to a sprained knee and eventually missed the remainder of the season. Ennis later transferred to play at Oregon. On December 19, 2015, Michigan defeated Youngstown State 105–46 with Wilson contributing 12 points on 5–6 shooting. The 59-point win was the second largest in school history. Although Wilson appeared in 26 games for the 2015–16 Wolverines, he only played as many as 10 minutes 5 times. Nevertheless, he finished second on the team in blocked shots with 10, including two in a January 12, 2016 upset of (#3/#3) Maryland. It was Michigan's first win over a top-three nationally ranked opponent at Crisler Center since the 1997–98 team defeated No. 3 Duke, 81–73, on December 13, 1997. In the January 1 Big Ten conference opener against Iowa, Wilson posted a career-high 28 points and 14 rebounds in an 83–86 overtime loss. On February 19, Wilson posted a team-high 16 points, including a game-tying three point field goal, in an overtime 78–83 loss to Minnesota. 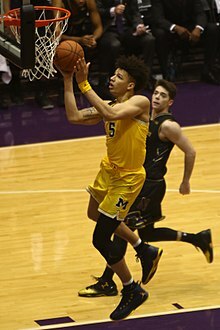 On March 10, Michigan defeated (#12/#13) Purdue 74–70 in overtime during the quarterfinals of the 2017 Big Ten Conference Men's Basketball Tournament. Michigan was led by Wilson with 8 rebounds, 3 blocked shots and a game-high 26 points, which was the second highest single-game scoring performance of the tournament (trailing teammate Derrick Walton's 29-point performance the following day). Wilson averaged 15.3 points per game for Michigan's four games during the Big Ten Tournament, helping the 2016–17 Wolverines emerge as the champion. Wilson averaged 16 points, 3 blocks and 4.3 rebounds in three 2017 NCAA Division I Men's Basketball Tournament games, helping Michigan reach the round of sixteen, where the team was eliminated by Ennis' 2016–17 Oregon Ducks. In the NCAA tournament wins against Oklahoma State and Louisville, Wilson went a combined 6–6 from the free throw line in the final 30 seconds of play. His overall averages for 7 postseason games was 15.6 points on 53.8% field goal shooting with 5.0 rebounds and 2.0 blocks. He finished the season as the team's leading rebounder and shot blocker with overall averages of 5.3 rebounds and 1.5 blocks. His 203 rebounds were the most by a Wolverine since Mitch McGary 4 years earlier and his 57 blocks were the most in nine seasons (Ekpe Udoh). Following the 2017 NCAA Tournament, he began to appear in various mock draft projections for the 2017 NBA draft. On April 4, 2017, Sports Illustrated projected him as first round selection, and ESPN analyst Eamonn Brennan stated that his awaited decision to enter the draft "seems like a foregone conclusion". The local press that covers Michigan, made little mention of the possibility of Wilson departing, however, according to SB Nation's Anthony Broome. At the time, some early pollsters included the 2017–18 Wolverines among the expected preseason top 25 teams, while several pollsters omitted the team from their rankings projections. On April 10, both Wilson and teammate Moe Wagner declared for the draft, but did not hire agents, which gave them until May 24 to withdraw their names and retain their athletic eligibility to return to Michigan. Declaring early allowed him to seek advice from the NBA Undergraduate Advisory Committee by the April 14 application deadline, participate in workouts with NBA teams beginning April 25 and this made him eligible for an invitation to the May 9 — 14 NBA Draft Combine. 57 of the 78 players who declared for the 2016 NBA draft without hiring an agent withdrew their names. On April 30, 2017, Jeff Goodman of ESPN reported that he was invited to the NBA Draft Combine. During the week prior to the NBA Combine, Wilson injured his quadriceps during a workout with the San Antonio Spurs, relegating him to taking part in physical measurements and interviews. Analysts were skeptical about Wilson's readiness for the 2017 draft. Wilson stated during combine interviews that he would not remain in the draft unless he was assured of being a first-rounder and was projected as a late first round selection by sources such as ESPN and DraftExpress. On May 24, Wilson announced he would remain in the draft, ending his Michigan career despite two years of remaining eligibility. On June 22, 2017, Wilson was drafted 17th overall by the Milwaukee Bucks in the 2017 NBA draft. Wilson joined a Bucks team that had a short-term hole to fill at power forward as Jabari Parker recovered from a torn ACL. Wilson was the first of four 2016–17 Big Ten Conference players selected in the draft. Wilson signed a rookie scale contract on July 6, the eve of the Bucks' first game in the 2017 NBA Summer League. Wilson debuted on October 20, 2017 against the Cleveland Cavaliers, but did not score or post any other stats. Wilson posted his first rebound on October 29 against the Atlanta Hawks and his first four points against the Oklahoma City Thunder two days later. During the season the Bucks assigned Wilson to their NBA G League affiliate Wisconsin Herd multiple times. Wilson missed the first 22 games of the season with a hamstring injury for the 2018–19 Milwaukee Bucks. Despite being injured and having only 71 minutes of NBA experience, he was still signed for a $3 million third-year option by the Bucks at the October 31 rookie-scale player options deadline. By late November he was able to appear in the G-League for the Wisconsin Herd. He saw limited action in two NBA games in early December, including his December 5 season debut against the Detroit Pistons. He had started in a total six games for the Wisconsin Herd, before being called up again on December 15, 2018 when Ersan Ilyasova had a nose contusion. On December 17 in a 107–104 win against the Pistons, Wilson saw his first meaningful action of the season, including defending against Blake Griffin's time-expiring 27-foot (8.2 m) heave and posting 9 points. On December 19 against the New Orleans Pelicans, he posted a career-high 10 rebounds and another 9 points, while surpassing 20 minutes of playing time for the second consecutive game. On December 27 against the New York Knicks, he posted his first NBA double-double with 14 rebounds and 10 points in 21 minutes. On January 16, he established a new career-high with 13 points against the Memphis Grizzlies. He improved his scoring best on January 31 against the Toronto Raptors by posting 16 points. ^ a b Quinn, Brendan F. (October 7, 2013). "Michigan hoops commit D.J. Wilson took advantage of 'defining moment' in recruitment". MLive.com. Retrieved April 5, 2017. ^ a b Quinn, Brendan F. (November 13, 2013). "D.J. Wilson submits NLI, becomes second official member of Michigan basketball's 2014 class". MLive.com. Retrieved November 17, 2013. ^ Stephens, Mitch (March 22, 2014). "O'Dowd beats Capital Christian 70-60 for NorCal title". San Francisco Chronicle. Retrieved September 21, 2017. ^ Quinn, Brendan F. (April 24, 2014). "Michigan signees Kameron Chatman, D.J. Wilson climb up latest 2014 recruiting rankings". MLive.com. Retrieved September 22, 2017. ^ Quinn, Brendan F. (August 6, 2014). "Michigan freshman D.J. Wilson undergoes finger surgery, will miss 4–6 weeks". MLive.com. Retrieved April 5, 2017. ^ Quinn, Brendan F. (October 3, 2014). "Michigan's D.J. Wilson, Max Bielfeld back from injury, cleared to play as practice begins". MLive.com. Retrieved April 4, 2017. ^ a b Kornacki, Steve (June 21, 2017). "Kornacki: How Wilson Went from Suspect to NBA Draft Prospect". MGoBlue.com. Archived from the original on June 22, 2017. Retrieved June 23, 2017. ^ Quinn, Brendan F. (December 1, 2014). "Michigan freshman D.J. Wilson to miss 3–4 weeks with knee injury, redshirt a possibility". MLive.com. Retrieved April 4, 2017. ^ Snyder, Mark (March 21, 2017). "Dylan Ennis' block of Wolverines D.J. Wilson lingers 3 years later". Detroit Free Press. Retrieved April 4, 2017. ^ "Walton Records Triple-Double as U-M Dismantles Youngstown State". MGoBlue.com. CBS Interactive. December 19, 2015. Retrieved December 20, 2015. ^ "Michigan overwhelms Youngstown State 105–46". ESPN. December 19, 2015. Retrieved December 20, 2015. ^ Quinn, Brendan F. (December 20, 2015). "Another triple-double? Second-largest win ever? Michigan's win vs. Youngstown State worth more". MLive.com. Retrieved December 21, 2015. ^ "Men's Basketball Score Central: Track the scores and schedules for all 14 Big Ten men's basketball teams for the week of Jan. 11–17, 2016". BigTen.org. CBS Interactive. January 12, 2016. Archived from the original on January 21, 2016. Retrieved January 13, 2016. ^ "D. J. Wilson 5". MGoBlue.com. CBS Interactive. Retrieved April 4, 2017. ^ "No. 16 Iowa beats Michigan 82–71". ESPN. Associated Press. January 17, 2016. Retrieved January 18, 2016. ^ "Wolverines Stave Off No. 3 Terrapins". MGoBlue.com. CBS Interactive. January 12, 2016. Retrieved January 13, 2016. ^ "Michigan holds on for 70–67 upset over No. 3 Maryland". ESPN. Associated Press. January 12, 2016. Retrieved January 13, 2016. ^ "U-M Comes Up Short in OT at Iowa in B1G Lidlifter". MGoBlue.com. CBS Interactive. January 1, 2017. Retrieved January 1, 2017. ^ "Iowa rallies past Michigan 86–83 in OT". ESPN. Associated Press. January 1, 2017. Retrieved April 4, 2017. ^ "021917aaa". MGoBlue.com. CBS Interactive. February 19, 2017. Retrieved February 20, 2017. ^ "Murphy, Minnesota outlast Michigan, 83–78". ESPN. Associated Press. February 19, 2017. Retrieved April 4, 2017. ^ "Wolverines Knock Off Top-Seeded Purdue in Overtime Thriller". MGoBlue.com. CBS Interactive. March 10, 2017. Retrieved March 10, 2017. ^ "Michigan's wild Big Ten ride continues with win over Purdue". ESPN. Associated Press. March 10, 2017. Retrieved April 6, 2017. ^ "2017 Big Ten Men's Basketball Tournament Statistics" (PDF). BigTen.org. CBS Interactive. March 12, 2017. Archived from the original (PDF) on March 13, 2017. Retrieved March 13, 2017. ^ "Michigan-Wisconsin Postgame Notes". BigTen.org. CBS Interactive. March 12, 2017. Archived from the original on March 14, 2017. Retrieved March 13, 2017. ^ "Michigan's Magic Ends with One-Point Loss to Ducks". MGoBlue.com. CBS Interactive. March 23, 2017. Retrieved March 24, 2017. ^ "Michigan get last shot but fall short to Elite 8-bound Oregon". ESPN. Associated Press. March 24, 2017. Retrieved April 4, 2017. ^ "Michigan Hits 16 Threes to Advance in NCAA Tourney". MGoBlue.com. CBS Interactive. March 17, 2017. Retrieved March 17, 2017. ^ "How Sweet! U-M Overcomes Louisville, Advances to Round of 16". MGoBlue.com. CBS Interactive. March 19, 2017. Retrieved March 19, 2017. ^ a b Quinn, Brendan F. (May 24, 2017). "D.J. Wilson will not return to Michigan, is pursuing NBA Draft". MLive.com. Retrieved May 24, 2017. ^ a b "Moe Wagner returning to Michigan, D.J. Wilson staying in draft". ESPN. Associated Press. May 24, 2017. Retrieved May 24, 2017. ^ a b "Wilson Goes 17th Overall, Becomes Eighth NBA Draftee in Beilein Era". MGoBlue.com. CBS Interactive. June 22, 2017. Archived from the original on June 23, 2017. Retrieved June 22, 2017. ^ Sharp, Andrew (April 4, 2017). "NBA Mock Draft 3.0: Tourney Shakes Up Board". Sports Illustrated. Retrieved April 4, 2017. ^ a b Brennan, Eamonn (April 3, 2017). "College hoops' royalty leads Way-Too-Early Top 25 for 2017–18". ESPN. Retrieved April 4, 2017. ^ Broome, Anthony (April 4, 2017). "ESPN says DJ Wilson to the NBA is 'foregone conclusion': ESPN has pulled out its Jump to Conclusions mat again". SB Nation. Retrieved April 4, 2017. ^ Davis, Seth (April 3, 2017). "Way-Too-Early Top 25 rankings for the 2017–18 college basketball season". Sports Illustrated. Retrieved April 4, 2017. ^ Eisenberg, Jeff and Henry Bushnell (April 3, 2017). "Way-too-early top 25 for the 2017–18 college basketball season". Yahoo!. Retrieved April 4, 2017. ^ Gleeson, Scott (April 4, 2017). "College basketball's super early preseason top 25 teams for the 2017–18 season". USA Today. Retrieved April 4, 2017. ^ Dauster, Rob (April 3, 2017). "2017–18 College Basketball Preseason Top 25". NBC Sports. Retrieved April 4, 2017. ^ Parrish, Gary (April 4, 2017). "After UNC's national championship, here's an early look at next season's Top 25 (and 1)". CBS Sports. Retrieved April 4, 2017. ^ Fagan, Ryan (April 4, 2017). "Arizona, Duke top way-too-early NCAA basketball rankings for 2017–18". Sporting News. Retrieved April 4, 2017. ^ Miller, Kerry (April 4, 2017). "Preseason NCAA Basketball Rankings 2017–18: Super-Early Top 25 Experts' Poll". Bleacher Report. Retrieved April 4, 2017. ^ Goodman, Jeff (April 10, 2017). "Moritz Wagner, D.J. Wilson declare for NBA draft, won't hire agents". ESPN. Retrieved April 11, 2017. ^ Quinn, Brendan F. (April 10, 2017). "Michigan's D.J. Wilson declares for NBA, but will not hire an agent". MLive.com. Retrieved April 11, 2017. ^ Quinn, Brendan F. (April 11, 2017). "As Moe Wagner and D.J. Wilson dip their toes, Michigan meets college basketball's new reality". MLive.com. Retrieved April 11, 2017. ^ Goodman, Jeff (April 29, 2017). "Sources: Lonzo Ball won't attend draft combine, might be joined by lottery prospects". ESPN. Retrieved April 30, 2017. ^ Snyder, Mark (May 11, 2017). "Michigan's D.J. Wilson out of NBA draft combine with quad injury, John Beilein says". Detroit Free Press. Retrieved May 15, 2017. ^ Snyder, Mark (May 13, 2017). "Michigan's D.J. Wilson, Moe Wagner leave NBA draft combine with questions". Detroit Free Press. Retrieved May 15, 2017. ^ Quinn, Brendan (May 9, 2017). "Analysts say Moritz Wagner and D.J. Wilson should return to Michigan next year". MLive.com. Retrieved May 15, 2017. ^ Ford, Chad (May 13, 2017). "Draft stock: Players rising, falling and intel from the NBA combine" (subscription required). ESPN. Retrieved May 15, 2017. ^ "Bucks pick at No. 17: D.J. Wilson, Michigan forward". ESPN. June 22, 2017. Retrieved June 23, 2017. ^ "Bucks draft Michigan forward D.J. Wilson". FOX Sports Wisconsin. June 22, 2017. Retrieved June 23, 2017. ^ Steedman, Bryan (June 23, 2017). "Hit or Miss Night for the Big Ten in the 2017 NBA Draft: Four Big Ten players were selected in the 2017 NBA Draft". SB Nation. Retrieved June 23, 2017. ^ "Four Big Ten players selected in Thursday's NBA Draft". BTN.com. June 23, 2017. Retrieved June 23, 2017. ^ "Milwaukee Bucks Sign D. J. Wilson". NBA.com. July 6, 2017. Retrieved July 7, 2017. ^ "Cleveland Cavaliers 2-0, 1-0 Away 116; 97 Milwaukee Bucks 1-1, 0-1 Home". ESPN. October 20, 2017. Retrieved October 21, 2017. ^ "Milwaukee Bucks 4-2, 2-0 Away 117; 106 Atlanta Hawks 1-6, 0-2". ESPN. October 29, 2017. Retrieved November 1, 2017. ^ "Oklahoma City Thunder 4-3, 2-2 Away 110; 91 Milwaukee Bucks 4-3, 2-3". ESPN. October 31, 2017. Retrieved November 1, 2017. ^ "Bucks assign rookies Wilson, Brown to G League". FOX Sports. December 1, 2017. Retrieved January 8, 2018. ^ "Bucks' D.J. Wilson: Recalled from G-League". CBS Sports. December 2, 2017. Retrieved January 8, 2018. ^ "Bucks assign D. J. Wilson to the Wisconsin Herd". NBA.com. December 20, 2017. Retrieved January 8, 2018. ^ "Bucks recall D. J. Wilson from the Wisconsin Herd". NBA.com. December 21, 2017. Retrieved January 8, 2018. ^ "Bucks assign D. J. Wilson to the Wisconsin Herd". NBA.com. January 2, 2018. Retrieved January 8, 2018. ^ "Bucks: Milwaukee waives DeAndre Liggins, signs Joel Bolomboy to NBA deal, gives Xavier Munford 2-way contract". Wisconsin State Journal. Associated Press. January 8, 2018. Retrieved January 8, 2018. ^ a b Velazquez, Matt (December 17, 2018). "Bucks 107, Pistons 104: Giannis leads the escape with another huge performance". Milwaukee Journal Sentinel. Retrieved December 20, 2018. ^ Velazquez, Matt (October 30, 2018). "Bucks elect to pick up options for Thon Maker, D.J. Wilson". Milwaukee Journal Sentinel. Retrieved December 20, 2018. ^ "Bucks' D.J. Wilson: Assigned to G League". CBS Sports. November 25, 2018. Retrieved December 20, 2018. ^ "D.J. Wilson: Healthy, plays 11 minutes". CBS Sports. November 29, 2018. Retrieved December 20, 2018. ^ "Bucks' D.J. Wilson: Recalled from G League". CBS Sports. December 5, 2018. Retrieved December 20, 2018. ^ "Bucks' D.J. Wilson: Assigned to G League". CBS Sports. December 12, 2018. Retrieved December 20, 2018. ^ Velazquez, Matt (December 5, 2018). "Bucks 115, Pistons 92: Putting it on cruise control in the second half". Milwaukee Journal Sentinel. Retrieved December 20, 2018. ^ "Bucks Recall D.J. Wilson from Wisconsin Herd". NBA.com. December 15, 2018. Retrieved December 20, 2018. ^ "Bucks' D.J. Wilson: Nears double-double in win". CBS Sports. December 20, 2018. Retrieved December 20, 2018. ^ "Bucks' D.J. Wilson: Double-doubles in win". CBS Sports. December 28, 2018. Retrieved January 17, 2019. ^ Velazquez, Matt (December 27, 2018). "Bucks 112, Knicks 96: Giannis gets the last laugh as a tense series concludes". Milwaukee Journal Sentinel. Retrieved January 17, 2019. ^ "Antetokounmpo, Bucks pull away, rout Grizzlies". Reuters. January 16, 2019. Retrieved January 17, 2019. ^ "Antetokounmpo scores 19, Bucks beat Raptors 105-92". ESPN. Associated Press. January 31, 2019. Retrieved February 1, 2019. This page was last edited on 12 April 2019, at 09:52 (UTC).